Pillar's critique is one of the most severe indictments of White House actions by a former Bush official since Richard C. Clarke, a former National Security Council staff member, went public with his criticism of the administration's handling of the Sept. 11, 2001, attacks and its failure to deal with the terrorist threat beforehand. Bush and company will, of course, deny these allegations and the Republican Congress is not about to investigate them, so I doubt anything will come of it. But if you want to know why Democrats are so angry (along with other people who are paying attention) then here it is in a nutshell. Democrats have a couple of interesting primary races this year, not least of which is the rematch between Former Congressman Ciro Rodriguez and current U.S. Rep. Henry Cuellar. Cuellar managed to boot Rodriguez out of his seat last time around thanks largely to Republican redistricting that took away familar San Antonio territory in exchange for a big chunk of Laredo. So the Laredo-based Cuellar was able to best the San Antonio-based Rodriguez in a race that came down to geographics. This time the race will be based on ideology and it will be interesting to see how many Laredo Democrats will stick by their man after he has practically shed his Democratic ties and donned a Republican cloak. 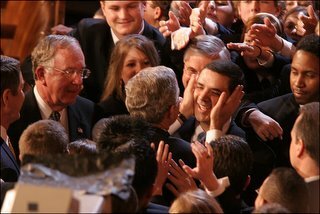 Recently, Ciro has become a regular celebrity over at Eschaton ever since President Bush gave Cuellar that curious face massage just before his SOTU speech. It has helped raise Ciro’s profile and contributed significantly to his campaign coffers. There is good reason why Cuellar is Bush’s favorite “Democrat” as the folks at Burnt Orange Report detail. Another interesting race here locally is state Sen. Frank Madla’s hotly contested re-election campaign against State Rep. Carlos Uresti. Like Cuellar, Madla is accused of being a DINO (Democrat in name only) who too often casts his lot with the Republicans. He has been especially hit hard on a vote to reduce funding for the Children’s Health Insurance Program or CHIP. The E-N had a story this morning that is apparently not online in which they note that Ciro is getting a lot of support from trial lawyers while Madla is getting lots of financial support from the traditionally Republican tort-reform groups. As I was driving in to work today I thought it was interesting that I would see clusters of Madla signs grouped together with Cuellar signs. How much you want to bet they are being put out by Republicans? Look whose neck is on the budget chopping block again. Big Bird. Bush wants to slash $150 million from Public Broadcasting, the sharpest cut yet. He just won’t let up on his ideological crusade to crush quality children’s television programming. In his $2.77 billion budget, Bush asks Congress to sharply cut or eliminate 141 government programs. Almost one-third of the targeted programs are in education, including ones that provide money to support the arts, vocational education, parent resource centers and drug-free schools. Bush: The Anti-Education president. That will be just part of his legacy, along with the corruption, incompentence and the bloody quagmire in Iraq. TxBubba of Southpaw notes that while Bush proposes saving $400 million by axing the Corporation for Public Broadcasting, he is advocating that we spend $670 million for the Broadcasting Board of Governors (BBG), the federal agency that supervises all US government non-military propaganda including the Voice of America, Radio Free Europe/Radio Liberty, the Middle East Broadcasting Networks, Radio Free Asia, and the Office of Cuba Broadcasting. What a pathetic waste of paper this is. There is no chance that Bush’s sorry excuse for a budget will ever see the light of day. Nevertheless, I think it is important that everyone study the proposed budget to see just how screwed up and misguided our president’s policies really are. The Wall Street Journal has excellent coverage of all the atrocities contained within Bush’s recipe for disaster. Much of the squeezing would be of programs aimed at low-income Americans - and wouldn't save all that much money in the aggregate. The budget is cowardly in the way it fails to address entitlement spending; frivolous in the way it handles defense spending; and downright cruel in the way it slashes domestic programs for the poor that will result in little to no savings - Especially when you realize he is more than offsetting any of those savings with requests for even more tax cuts for the wealthy. But as the WSJ points out, this budget will be DOA when it gets to the Congress. Bill Crawford of All Things Conservative is back from his extended hiatus. Also, I was delighted to find out today that two groups have opted to advertize on my humble little site. Wow! I’ll be raking in the big bucks in no time! WooHoo! !